There is a Walking Bird and a Driving Bird tour on Grand Turk with clearly marked trail signs and lots of birds to show you the way in this “first in the Caribbean” tour. 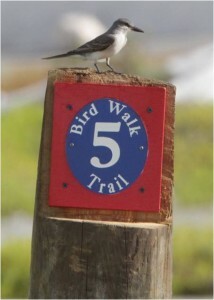 This little grey Kingbird is ready for the tour. Photo by Dr. Mike Pienkowski. 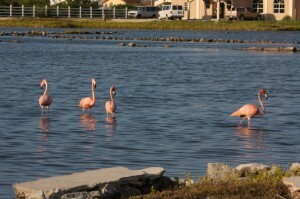 Flamingo’s and an Osprey on the remnants of a windmill are just a few of the birding possibilities in Town Salina. Black Necked Stilt five day old chicks can be seen wading in the Great Salina and ducks aplenty are at South Wells, with Egrets, Pelicans and Herons at North Creek. 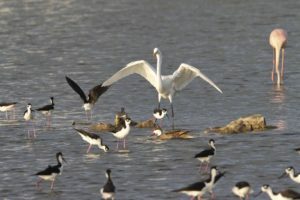 These salt ponds are home to a unique variety of birds and, because of the location of the ponds, water birds regularly approach people more closely than almost anywhere else in the world. For the driving tours golf carts, rental cars and bikes are available for rent from various vendors on the island. The walking tour is about 2 hours at a leisurely pace, the driving tour is about 3 hours. Both can really be done in less depending on how long you stay at each stop. We sell guides in the museum gift shop for both a walking $5 and driving tour $10, both are self-guided. 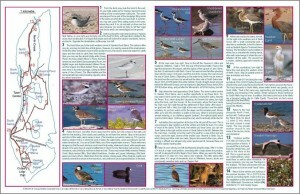 The guides include a map, written steps on following the map, information about each stop including what types of birds are typically found at each location. The guides are nice and well worth the small amount we charge. We also sell a few other booklets about the birds of each island and the Turks and Caicos in general that you may be interested in. Flamingos almost close enough to touch. Photo by Dr Mike Pienkowski. The trails are a joint effort of the Museum and the the UK Overseas Territories Conservation Forum (UKOTCF) and were supported by a grant from the Carnival/TCInvest/TCIGovernment Infrastructure Fund. After two hurricanes in 2017 many of the signs were damaged or destroyed. Thanks to the Governors Office for providing a grant so that the signs and markers could all be replaced in 2019. 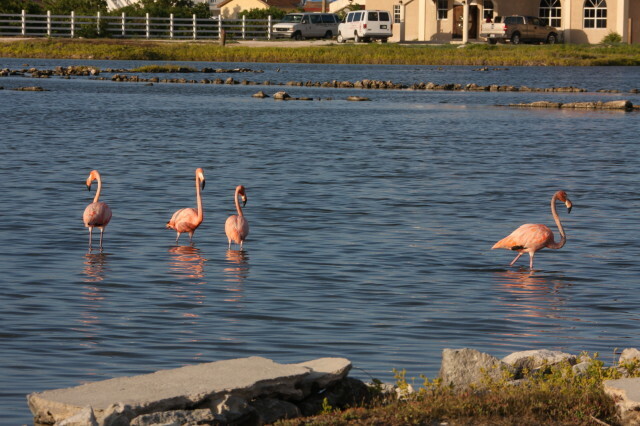 Various birds were spotted together in this salina on Grand Turk. Photo by Dr. Mike Pienkowski. The Turks & Caicos National Museum is a proud UKOTCF Member Organization. For more information visit the UKOTCF website.